When it comes to budding filmmaker technology, creating an immersive theatrical experience is the name of the game. In the last few years, we’ve seen the immense growth of formats like 3D and IMAX, with filmmakers like James Cameron, Christopher Nolan, Peter Jackson and Brad Bird pushing boundaries to see what new cameras and tech can do, but now we’re even stepping beyond that. 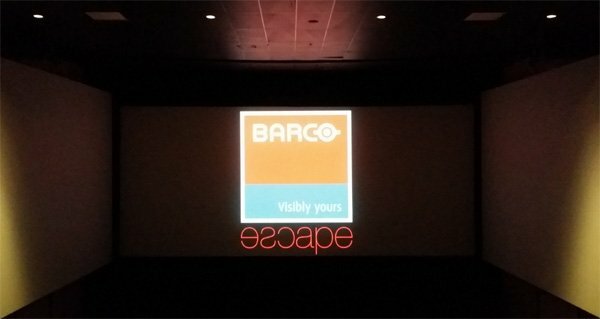 This summer we saw the arrival of the first 4DX theater in the United States, and soon we will be seeing the growth and expanse of a whole new format: Barco Escape. We first told you about the three-screen theaters earlier this month, introducing its unique three-screen system. But now, I have actually had the opportunity to be a part of the immersive theatrical experience myself. Director Wes Ball’s The Maze Runner, which will be in cinemas nationwide this weekend, is the first theatrical feature that will be shown in the Escape format, and last night I was invited to a very special screening in Los Angeles to see it first-hand. Barco "CinemaVangelist" Ted Schilowitz was on hand to introduce the screening and explain some of the finer details and future plans of the Escape format. Describing the technology being at "Phase Two," he added that the strategy right now is to stick using VFX to generate footage for the extra screens going forward (they’re currently using highly advanced game engines). That said, there is a potential future where filmmakers could eventually use custom rigs that would allow them to shoot Escape natively. All told, only about eight minutes of The Maze Runner - split into two sequences - featured footage on the extra Escape screens (rather understandable given the nascence of the format). The first of these sequences is the very beginning of the movie, which features the main character, Thomas (Dylan O’Brien), waking up in quickly-rising freight elevator surrounded by all kinds of crates and boxes. Not needing to really show much extra detail, the side displays primarily featured the grated sides of the elevator. While this seems rather minimal, it had a fascinating visual effect, as the extra projections actually do actually make it feel like the audience is looking into a wide open box rather than just at a flat image. All of the negative space contained between the three screens was suddenly enhanced. The rest of the Escape material was packed into the big action sequence in the second act, which sees Thomas and his friend/fellow captive Minho (Ki Hong Lee) racing through the maze as the gigantic walls are shifting and changing. The nature of the scene let the Escape screens operate in a different capacity than the first one, and while it was certainly interesting and at times very cool, I didn’t find it as effective. This can partially be blamed on the fact that some shots between the three screens didn’t sync up 100%, but the cuts in the sequence were also so frequent that it was sometimes disorienting to try and keep up with and absorb all of the action coming at me. That said, when the camera is following directly behind the characters while zooming though the walls, the immersive quality is impressive and real. The Maze Runner will be opening in Escape theaters nationwide this weekend, though there are currently only five of them in the United States - located in Davie, Florida, Woodridge, Illinois, Plano, Texas and Redwood City, California in addition to Los Angeles (you can find more information on the official website here). The format is not only fascinating, but could potentially open the door to a whole new style of immersive filmmaking. It will be exciting to see it grow.